Since I had baby L, I kept him in our room next to me, but, our room is very small so I had to climb over the bed to get him in and out of his cot. I didn't like the idea of him stuffed in a corner, so I moved his cot in with his sister, which is also a tiny room but with a smaller person in it. It required a massive clear out and moved out some furniture to accommodate his cot and his chest of drawers. Finally things are feeling a bit more civilised and the room is now called the 'kid's' room! Books are the main issue here, but little P was quite decisive about which ones could go to the charity shop. I managed to fit all her toys under the bed, thanks Ikea. Beautiful job on the rooms. I had to make my daughter, when she was little, a room in a big closet. She loved it! Hope sis is okay with sharing! Really glad you are feeling better! Sorry to hear you've all suffered from norovirus. :( The kids' room looks extremely cosy and functional. A job well done! The fireplace is so cute. 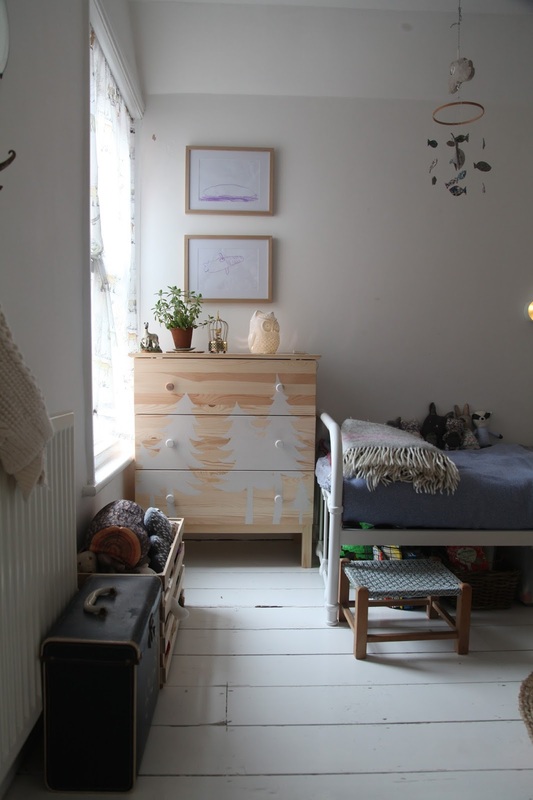 also I am about to buy the same chest of drawers, I think, but I'm going to paint it blue. Sweet! We moved our girls together in one room to make room for their little brother, or rather his changing table and diapers, he still sleeps in our room. They have a rather small room but we managed to fit a big bunk bed and built them each a little table by the window. It feels surprisingly airy and tidy and they love it. Now they can't imagine not sleeping in the same room and kindly offered to make room for their brother too later so he won't have to sleep alone. We will see when they are teens though. I think as long as they each have their private spaces within the room and we also have a lot of space for socializing in the rest of the house it will work. It helps that we live in an area with a lot of big families where many kids share a room. I am talking big families, like 6 to 8 kids in small apartments. We truly are fortunate to have our own house and yard and the wood right outside. Also our house is quite big though we du not have many bedrooms, we could make another room, but that would kind of ruin a lot of the spacious feeling. 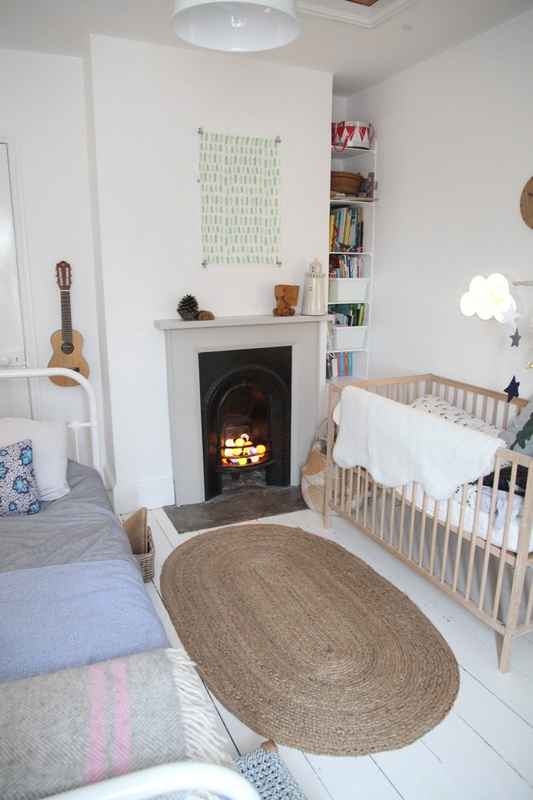 Such a lovely room for children and not a hint of pink plastic how lucky they are ,love the lighthouse where did it come from? 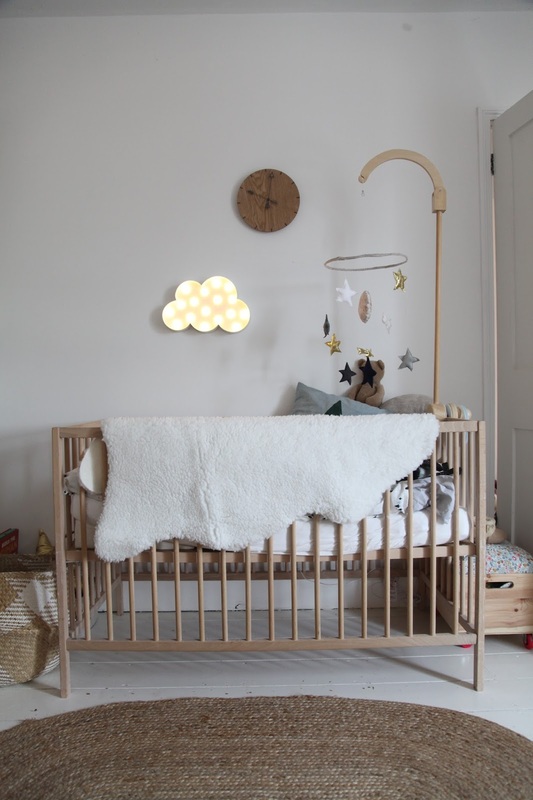 What a wonderful room, can I ask where the cot is from? Thank you. I love those little glowing lights in the "fireplace"! What a cute idea!! Such a cosy looking room!